Liebe: Ein unordentliches Gefühl by Richard David Precht. Translated by Jue Xu-ling. In this era, is love still a topic worthy of discussion? Several years ago, I read a post shared widely on the Internet in which a famous entrepreneur provided young people with ten pieces of advice. Among them, he only lightly touched upon love, stating that there were only two kinds of love: love and love no more. He maintained that when people cried from falling out of love, as long as they provided heat treatment to their eyes with hot towels, they would be fine the next day. But is it really as simple as he claimed? My friends describe to me through Facebook Messenger various entangled relationships. I always listen patiently and provide companionship. In the meantime, I construct in my mind the ideal, fantasy world in which love goes first. I thought more diverse means of disseminating information would be conducive to us arriving there; however, I have found that we all have severe difficulty in making choices. Last year, I ended a 3.5-year relationship and stopped being someone’s girlfriend. After that, I had several short relationships. They were common in that they all started zealously and ended with nothing but a few photos in my cellphone photo album. Each time, I went all in because I believed that “we” were special, and, incidentally, that person thought the same as I did. Only after I confessed this belief to my friend did it dawn on me that I behaved identically to the character Pan Jinlian from Jin Ping Mei, who strived to prove her worth to her loved one. So, we were not special, after all. I am smothered by the huge number of relationships around me, relationships both created by me and collected from my friends, and cannot surface for air. I must construct a space to store these emotions. Where did these events happen? According to the conventions of Chinese tales of the miraculous, these affections that are so difficult to express in words typically occur in remote locations with few people, such as abandoned ancient wells, cottages deep in the mountains, long-neglected flower gardens, gatehouses in quiet alleys, and haunted temples. The mysterious charms emitting from these spaces are still as strong in urban space. As love begins, the spirits and anomalies cast their spells, and all the decayed are transformed into a glamorous illusionary realm filled with bird songs and flower fragrance, a world in which only your beauty registers. 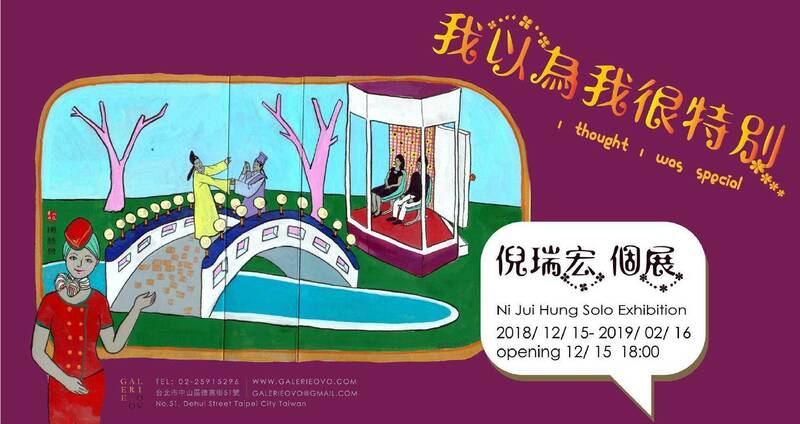 Her artworks record about life around the various absurd situation encountered, especially the world's most difficult to worry about the feelings of trouble. Her artworks of materials, she has many special preferences, she will use the packaging carton creation, because the packaging carton shape is very beautiful and smell very fragrant.When she goes into the state of art, the magnetic field is followed to change, many viewers will be because of her figure and then specifically to find her talking, and then into a friendship, she will be the audience and personal experience together, the use of painting. To record the whole process. She will use her special point of view, to arbitrarily dispatch her hands to collect a variety of images and colors, the screen of the flat girls are her hired actor, to show the world her unique human observation, and look forward to their own The humor of the work, bring some people around the little happy.